This past week Taipei, Taiwan's capital city of 2.7 million residents, made international headlines regarding its path toward becoming a more sustainable metropolis. Taipei was included in Siemens' Asian Green City Index, a report conducted by the Economist Intelligence Unit. 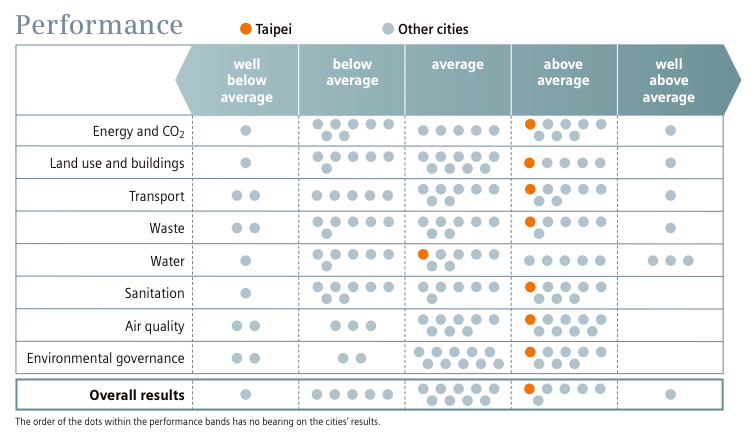 The index evaluates 22 major Asian cities across eight categories: Energy and CO2, Land Use and Buildings, Transport, Waste, Water, Sanitation, Air Quality, and Environmental Governance. Although the report is excellent and I recommend it to be read in entirety, I will focus only on Taipei's results in this post. 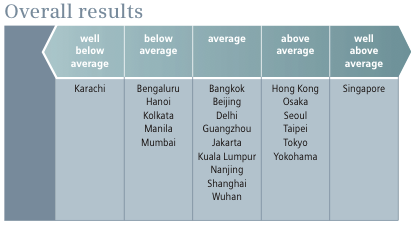 Overall, Taipei placed in the above average category alongside five other cities. Taipei achieved above average marks in 7 out of 8 categories, only falling to average status in its water performance. Based on its quantitative score, Taipei achieved 2nd place overall. Taipei performed especially well in the energy and CO2 category. Despite a lack of renewable energy sources, Taipei's per capita CO2 emissions were the lowest amongst the six high income cities featured (US $25,000 per capita GDP and higher). While this is partly a function of the relatively low-carbon footprint of Taipei's large business and services sector, lower CO2 emissions can also be attributed to the success of the Taipei MRT and BRT systems. The report highlighted Taipei's efforts in the green building sector through its incentives for green roofs and eco-friendly construction materials. Taipei also drew praise for its per capita green space, public transportation system, and 99% rate of access to sanitation. Alongside Singapore, Taipei distinguished itself from its peers with its waste management prowess. Taipei collects 100% of its waste while managing to produce the second lowest amount of total waste in its high income city bracket. Taipei's success is a national trend: Taiwan has been very successful in fostering awareness and action in recycling. Taipei recycles 45% of its total waste and only allows an estimated 5% of household waste to end up in landfills. Water was the only category in which Taipei failed to score above average. Taipei has a relatively high rate of per capita water usage, compounded by a leakage rate of 22%. While Taiwan's water issues warrant their own post, it is worth mentioning that Taiwan's cost of water has remained unsustainably low with no immediate plan to raise prices. The Siemens report does highlight a US $800 million dollar investment that seeks to raise Taipei's leakage rate 1% annually through 2025. However, Taipei's high rate of water use is unlikely to drop without pricing reforms. The Siemens Asian Green City Index depicts a highly sustainable Taipei. In each of the eight green city categories, Taipei has enacted or is in the process of implementing progressive policies. However, the most significant problems identified by the report (high rates of personal car use, poor performance in efficient water use and low share of renewable energy sources) may require more complex solutions than current policy provides. These issues are not specific to Taipei and can be extrapolated to Taiwan as a whole. I will revisit Taipei in the future with a more in-depth post on its eco-city progress. For now, Taipei can enjoy its accolade of "Asia's second greenest city."